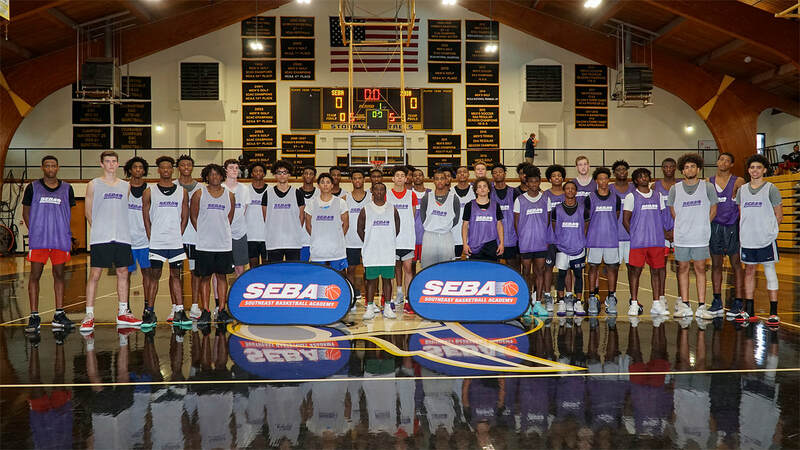 The 2018 SEBA Atlanta All-Star Shootout was held September 15th on the campus of Oglethorpe University in Atlanta. This 16th Anniversary Fall event featured a full capacity roster of 200 prospects from all areas of Georgia, as well as from the states of Florida, Tennessee, South Carolina, Alabama, and North Carolina. The Shootout provided excellent exposure to all of the participants, as over forty-two (42) coaches representing thirty (30) College programs from throughout the South were in attendance to evaluate and recruit the talent on hand. Multiple media and scouting outlets were also onsite to cover the event. Highly athletic wing prospect with a great motor; there is much to like about Eze’s game. He showed a balanced perimeter skill set, accurate mid-range jumper, and plays with a noticeable intensity that stands out. He is at his best when attacking the rim. An excellent finisher, he plays above the rim and had several highlight reel worthy dunks throughout camp. He is an extremely active defender and strong rebounder. A proven winner, Eze has already won a State Championship at Mt. Bethel and looks to add another one this year as Coach Cal Boyd’s squad will be strong contender in Class A Private. Amongst a camp roster of many talented players, Evans shined brightly. He played with great energy, scored all over the court, and exhibited a versatility not often seen in player his size. Whether it was knocking down jumpers from the wing, taking his man off the dribble for smooth scores, or throwing down thunderous dunks….he made his game known. After being named 1st Team All-Region last season at Richard Hardy High in Tennessee, he will complete his Senior year at Duluth High in Gwinnett County. 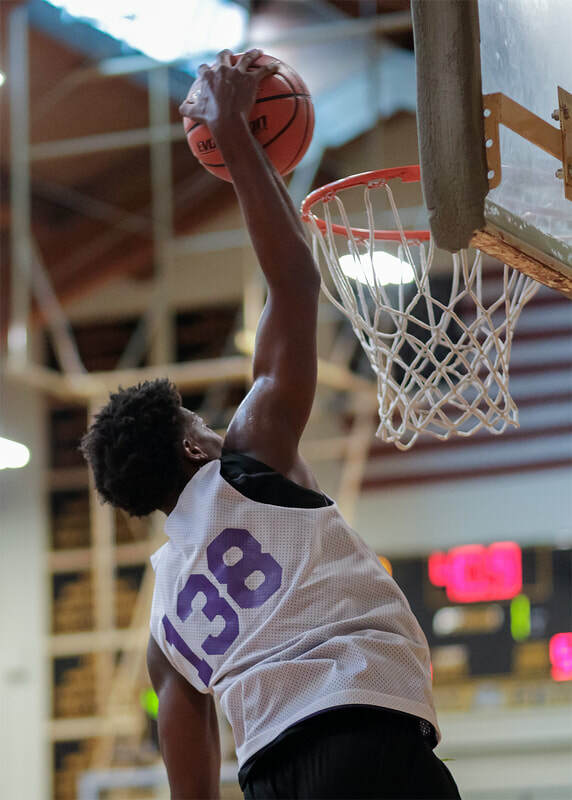 Look for him to be one of the top 2019 Wing prospects in the Peach State this season. One of the most intriguing prospects in attendance. His length coupled with dual ability to play in the post and on the wing makes him a tough matchup for opponents. Demonstrated a good three point stroke and is comfortable on the perimeter. Moves well without the ball. Was extremely effective scoring in the 12-15 foot range. Defensively, pulled down a good share of rebounds. As he continues to get stronger, the potential is there for him to be a very good player at the next level. Elite academic student with 3.96 GPA and 27 ACT. Recruitment is trending upwards as many schools are expressing interest and expect that to build over the coming months. Quick and talented lead guard who can score and distribute. High level ball handler with good court savvy. Creates well off the dribble and gets good separation on pull-up jumper; finishes well in paint. Knock down shooter from beyond the arc. Has quickness to draw defense and kick to open teammates for open looks. Active on defensive end and picks up good share of steals. Averaged 18 ppg and 4 assists as a Junior and was selected All-Region. Excellent student with 3.96 GPA. Look for him to be one of the top players this coming season in talent filled Cobb County. Highly athletic 2020 prospect put on a show with his scoring ability, speed, and leaping ability. He thrived in transition and had multiple dunks that lit up the gym. Opposing defenses had a very difficult time keeping him out of the lane, where he finished consistently. Showed outside shooting ability, both on pull-ups and while converting several contested three-pointers. Has very good defensive instincts and plays passing lanes well. As he continues to develop; the stage is set for a major breakout year. The tools are certainly there for him to be a special prospect in Georgia’s 2020 class. Long and Athletic wing who performed very well at camp. Was a problem for opposing defenses, as he slashed to the rim for driving buckets, knocked down jumpers, and posted up smaller opponents. He covers ground quickly on the fast break and can finish with authority above the rim. As he continues to fill out and get stronger; the potential is there for him to be a very good player at the next level. Was named Walton County “Player of Year” and 1st Team All-Region 8-AAAAA selection as a Junior while averaging 19 ppg and 11 rebounds. The best way to describe Tay Howard’s game is multi-dimensional. He does many things well and has the ability to fill the stat sheet in many categories. He is a good facilitator and sees the floor well as a bigger guard. He is a good penetrator off the dribble and finishes well around the basket. He is quality three-point shooter. Defensively, he is capable of guarding multiple positions and rebounds very well for a guard. He understands team defense and is exceptional as a help defender, taking charges, and getting steals. In the classroom, he carries a 3.7 GPA. Named 1st team All-Region last season and is poised for a big Senior year. Long and wiry wing guard impressed with his ability to score the basketball in a variety of ways. He can create his jump shot off the bounce and is also a capable spot up three point shooter. Looked good taking the ball to basket and finishes strong. Well coached and understands team defensive principles. Strong rebounder from guard spot where he is effective in initiating the fast break and creating for others. Well rounded and impressive prospect. Will team up with Jeremiah Sanabria at Allatoona to make a formidable frontcourt duo for the Pirates. Strong guard with good size, toughness, and speed. Natural leader. Whether it was knocking down long treys, attacking the rim, or dishing assists to teammates for easy buckets, Brandon made plays to help his team win. He is an aggressive on ball defender and active in passing lanes. Good student with 3.8 GPA. Will serve as anchor for perennial state power Jonesboro High this season. Physically imposing forward with strong frame; McDowell is another Mill Creek product who had a great showing at camp. He is very effective inside the paint as both an interior scorer and defender. Powers through contact for hard earned buckets, but also has good first step for his size (had several scores while blowing past defender). Has solid range on three point shot. One of the better rebounders in camp; he is a guy who does many things to position his team to win. His 3.5 GPA and 1150 SAT score makes him an attractive target for more selective academic schools. Versatile forward who caught the attention of multiple schools over the weekend. Inside-out threat with athleticism, strength, and physicality. Runs floor well and is strong finisher in paint. Excellent rebounder on both sides of the floor. Had numerous tip-ins and putbacks. Knocked down mid-range jumper consistently and has feathery scoring touch around the rim. Strong rim protector. He is a player coaches will want to keeps close tabs on this season in Cobb County. Scoring lead guard who played his way onto the radars of multiple Coaches on Saturday. After averaging 23 ppg and 6 assists as a Junior at Gatlinburg-Pittman High in Tennessee, Jaylyn has returned back to his native Metro Atlanta for Senior year. He will play a key role for a talented Duluth team. Offensively, he has good quickness and utilizes nice collection of dribble moves to score at the rim. Has a very nice pull-up jumper where he gets nice separation from the defense. Is dangerous in transition as a scorer and distributor. Sees floor well and passes out of double teams effectively. Standout student who carries a 3.5 GPA and 25 ACT score. Emerging prospect with athleticism, length, and considerable potential. He demonstrated a solid cache of scoring moves on the low block. Has ability to finish above the rim with authority. Runs the floor hard in transition. Has good instincts on the defensive side and plays well within a team set as a help side defender. His on court talent combined with above average academic credentials will certainly bring recruiting attention over the coming months. One of three Mill Creek players to Make the Top 30 All-Star Game. 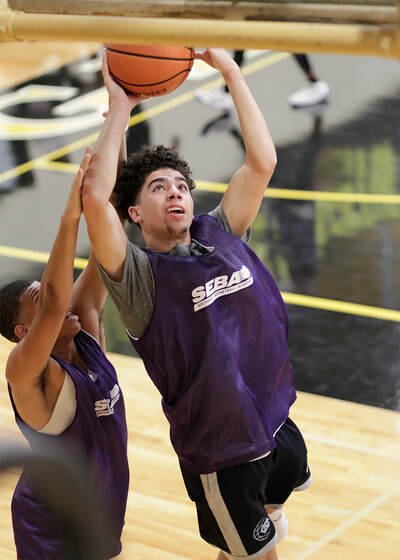 Strong framed guard who had a good showing at camp; His leaping ability and physical strength allow him to play much bigger than his height. Displaying acrobatic drives, pull-up jumpers, and strong finishes at the rim, Billig had a number of the college coaches in attendance highlighting his name. He did a good job of seeing the floor and setting up teammates with well-timed passes. Defensively, he has great versatility and is capable of guarding smaller guards and bigger forwards. Top notch rebounder at the guard spot and creates many second chance opportunities for his team on the offensive glass. Will be go-to player for Coach Pat Abney’s Pope squad this coming season. If selecting a player who had the most efficient production on Saturday, Anthony Spencer would certainly be in the conversation. The Harris County product was a standout on both ends of the floor where he used his athleticism and high motor to impact the game in many ways. He scored the ball from all three levels and created for others. Most impressive was how active he was on defense, where he fought thru screens, forced turnovers, and picked up steals in the passing lane. He had a back-to-back sequence where he stole passes and went in for consecutive dunks. Tough player that any coach would appreciate. One of the most athletic players in camp; Green made his presence known early on in his team’s first game with two thunderous dunks right out the gate. The high riser gets up and down the floor extremely well on the break. He has the wingspan, quickness, and wiry strength to create defensive havoc while guarding the ball and in the passing lanes. In the half court set, Green looked good slashing to the rim and exhibited a solid jumper. An excellent student, he maintains a 3.8 GPA in the classroom. Should play an important role for State power Buford this coming season. Prospect with significant upside for the next level. Talented prospect out of Savannah brings many desired qualities to the court as a prospect. He is athletic, tough, and has a versatile skill set. Crisp attacked the rim, crashed the boards, scored in transition, and knocked down treys. Defensively, he is capable of defending multiple positions. On top of his on court talents, he is a stellar 4.0 GPA student in the classroom. Was named 1st team All-State last year as a Junior while averaging 19 ppg and 10 boards. Will be key piece for Len Williams’ talented Woodville-Tompkins squad that is a State Title contender in Class A-Public. Rim protecting big man with excellent potential. Thrives on the defensive end of the court; Moves well and has great shot blocking instincts and feel for being around the ball. Blocked or altered many shots throughout the day. Served as an intimidating interior force for opponents. A relative newcomer to the game, his inexperience shows in his tendency to pick up fouls, and his overall offensive game is still raw. However, there is no question that he has significant upside and is just starting to scratch the surface of the player he can become. 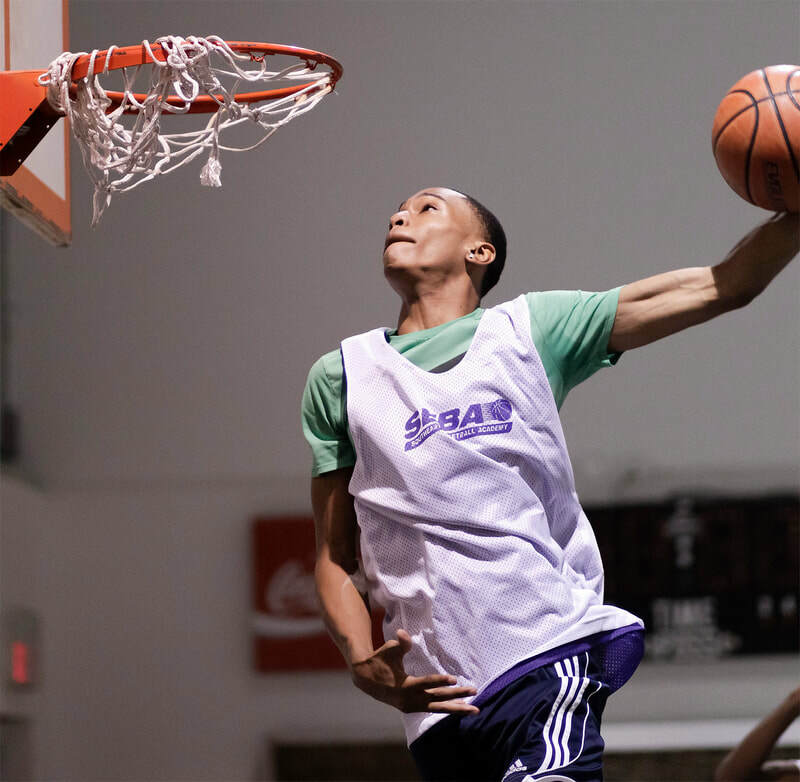 The Camp roster boosted a deep pool of talented 2019 perimeter players who will play at the next level. In addition to the players listed above, here are some others who also made their mark. Miles Herron (5’ 10, PG, Roswell) is a talented floor general who can score, distribute, and defend. Named the North Fulton “Player of the Year” as a Junior, he is very good at creating off the dribble and has a deadly pull-up jumper from 15 feet and extending out beyond the three point line. He has good body control and showed the ability to finish consistently at the rim. Dakota Leffew (6’ 3, CG, Jonesboro) was a breakout performer who had an excellent camp. An athletic guard with good size and a solid handle, he scored off the bounce and showed ability to finish above the rim. He is an impressive defender who plays with good intensity and will look to step into a featured role for the always tough Jonesboro Cardinals. Jacarlin Dennis (5’ 7, PG, Griffin) is a super quick and strong framed guard who can score in bunches. Opponents had a difficult time staying in front of him, as he got to his spots on the floor with ease. Has the ability to get very hot from beyond the arc. Dennis never slowed down at camp; even though he played a football game the previous night for Griffin. Tough kid who knows how to compete. Jonathan Pefanis (5’ 11, PG, North Forsyth) is a heady point guard who makes the players around him better. He is a good distributor and gets the ball to his teammates at the right time for high percentage shots. After leading his North Forsyth in almost every offensive category as a Junior, look for Pefanis to have a big senior season. Josiah Stewart (6’ 3, SG, Lamar County) is a high energy guard with good size and strength. He is aggressive in taking it to the rim and finishes strong. Several coaches commented on his hustle and willingness to do the little things to help his team succeed. He will look to build upon a good Junior year in which he was named All-Region. Caleb Ifill (6’ 1, CG, Shiloh Hills Christian) is a player who seems to gets better each time we see him. The long guard has a quick first step and is effective as a slasher; finishing consistently at the rim. He keeps the defense honest with a solid three point shot and has good court vision, lacing several assist through the defense for easy baskets. Jalen Milner (6’ 1, CG, Georgia Military Prep; 2019) is an aggressive guard who can put points on the scoreboard. He attacks gaps in the defense well and his pull-up jumper is lethal. Playing under Georgia high school coaching legend James Lunsford, Milner is a player to watch in Middle Georgia this season. Justin Perry (6’ 3, SG, Kell) is a player who had coaches opening their booklets to see who he was. A knockdown outside shooter with long wingspan, he was vocal, engaged, and always around the ball. His skills combined with a 3.5 GPA makes him a guy to definitely track in Cobb County this season. College Coaches looking for a knockdown shooter need to check-out Jalen Westfield (5’ 11, CG, Dalton). The sharp shooter from North Georgia can really fill it up from beyond the arc. He uses screens well to get open and has a quick release. John Allen (5’8, Marietta) was one of the smallest players in camp, however the Marietta guard has “big” game. He plays a fearless brand of basketball, attacking the rim, dishing out assists to teammates, and playing great on ball defense. His desire and will to compete was fun to watch. Bryson Dennis (5’ 11, PG, Stone Mountain) was a pleasant surprise prospect, as he took full advantage of the opportunity to display his talents throughout the day. He is a scoring guard who can get it done at the rim, from mid-range, and beyond the arc. He also showed good court vision in setting up teammates for easy buckets. Player to watch for Coach Stroud’s Stone Mountain squad. Jordan Bragg (5’ 11, SG, New Manchester) is a good looking lefty guard who can really shoot the rock. He is a very dangerous spot up shooter from three point land; if he gets a clean look, chances are he will knock it down. He sees the floor well and made good decisions with the ball. It would be hard to find a player who gives more effort on the court than Shami Shields (6’ 2, Guard, South Paulding; 2019). He is a very good rebounder from the guard spot, versatile on defense, and plays with great intensity. Jerriah Love (5’ 10, PG, Berkmar) is another standout from the state of Tennessee who has moved to Gwinnett County for his Senior year. He is a natural point guard who focuses on getting others involved. He uses change of pace moves really well and gets into the lane to create scoring opportunities for himself and teammates. He is an aggressive on-ball defender and will be a nice addition for Greg Phillips’ perennial state playoff program at Berkmar. Anthony Jones (6’ 1, CG, Vidalia) is an all-around athlete who plays with great energy. He has good speed and is dangerous in the open court. Was one of the top on-ball defenders and has quick hands. Should be a go-to player for Vidalia program that is always in State Title discussion. Kevin Wirth (6’ 1, North Paulding) is a skilled and fundamentally sound guard who had a good camp. He has deep range on his three point shot, but is also adept at taking the ball to the rim and finishing in the paint. The All-Region selection holds a 3.7 GPA and is a nice target for higher academic schools to evaluate. Deante Green (5’ 10, Woodville-Tompkins) is a traditional point guard who runs the show with good poise. His decision making was excellent and he showed the ability to score when needed. Micah Chadwick (5’ 11, PG, Johns Creek) had a good showing throughout camp. He shot the ball really well from beyond the arc, made good decisions with the ball, and played with great hustle. Sporting a perfect 4.0 GPA in the classroom, we would expect schools to be reaching out to him after his strong camp performance. The talented backcourt duo of Khy Collins (5’ 10, PG) and Nathan Francis (6’ 2, CG) from Long County High impressed with their play on Saturday. Collins is a first rate facilitator who orchestrated his team’s offense with good ball handling, precise passing, and court vision. Francis boasts a well-balanced skill set where he knocked down treys, finished at the basket, and led the fast break. Should form one of the better backcourts in Class AAA this coming season. Brelan Holston (6’ 1, PG, George Walton Academy) is a rising point guard with good upside. He sees the floor well and dished several impressive assists to teammates. He is a legit three point threat with deep range on his shot. After averaging 18 ppg as a Junior, look for Holston to have a big Senior season. Jordan Whitening (5’ 11, PG, Redan) is floor general with good intangibles. He is an excellent passer and has a high basketball IQ. He uses his shifty speed to attack the defense and create for himself and others. A top notch student, Jordan maintains a 3.97 GPA and scored a 1140 on the SAT. Justice Hayes (6’ 2, SG, Cass) is a guard whose on-court intensity and physicality drew the attention of coaches and evaluators. In addition to his scoring ability, the Bartow County prospect defended, crashed the boards, and played with good toughness. Alex Forde (6’ 3, Wing, Etowah; 2019) is a late blooming prospect who has progressed rapidly over the past year. With an athletic frame and College ready body, he is a physical on ball defender capable of guarding multiple positions. In addition, he is a good spot up shooter capable of getting hot from three point land. Myson Lowe (5’ 9, PG, Whitefield Academy; 2020) is a cat quick lead guard who controlled the game with his scoring and passing abilities. He was able to get into the paint at will, where he finished at the rim or converted short pull-ups and floaters. When defense collapsed, he made the right play by finding open teammates. Promising guard prospect who will continue to develop under the mentorship of Courtney Brooks at Whitefield. Javen Smith (6’ 0, PG, Redan; 2021) is a dynamic young guard who can really score the basketball. Whether it was knocking down contested threes, taking it to the basket, or in transition, Smith made it look effortless. Named All-Region and Georgia “Freshman of the Year” in Class AAA last season. With continued development of his complete game; there is no question the future is very bright for the Dekalb County product. Demajion “Dee” Topps (5’ 11, PG, New Manchester) is an explosive point guard who was able to break his man down off the dribble with ease. He is an elite finisher around the rim and knocked down his fair share of jumpers as well. A blur in transition, he has tremendous leaping ability as evidenced by several impressive dunks. Prospect with great potential for next level. Micah Roebuck (6’ 0, PG, Franklin County; 2020) is a scoring guard who can really put points on the board. He is a very good shooter off dribble combinations, possessing a quick and fluid release. We like how he plays within himself and doesn’t force the action. Named All-region and honorable mention All-State as a sophomore, look for Roebuck’s stock to continue to rise amongst 2020 prospects. Rico Wade (6’ 1, PG, Arlington Christian; 2020) is a player who grabbed the attention of evaluators with his high energy, desire, and athleticism. With a strong body and the ability to withstand contact, he repeatedly got to the rim and converted drives in traffic. He is an aggressive defender and very active on and off the ball. Saigon Kitt (6’ 0, CG, Sprayberry; 2020) is a player who has improved significantly since last seeing him at our Spring event. He scored frequently from three point land and while attacking the rim. He sees the floor well and made good decisions with the ball in his hands. Has all the makings of being a breakout player in Cobb County this season. Cody Gaynes (5’ 9, PG, Marist; 2020) is an energetic lead guard who plays with great hustle and skill. Named All-Region last year as a sophomore, he was all over the court on Saturday. While a capable scorer, he was at his best distributing and setting up teammates for scoring opportunities. Brandon Sherer (6’ 0, PG, Forsyth Central; 2020) is a zone busting guard with deep range on his three point shot. Plays with good poise and has enough quickness to keep the defense honest. Talique Williams (5’ 9, PG, Harris County; 2020) was among the top pure point guards in attendance. The two time All-region selection does a great job breaking down opposing defense with quickness and ball handling moves. A strong full court defender, he applies great pressure to his opponent up and down the floor. Excellent student with 4.0 GPA, he is a prospect high academic programs will want to take a close look at. There is a impressive sleeper lurking in Savannah by the name of Bernard Pelote III (6’ 6, Wing, Woodville-Tompkins; 2020). Standing 6’6, Pelote is an athletic wing who can handle, shoot from the outside, slash to the rim, and score in the paint. Defensively, he was very active on the ball and help side, and crashed the board on both ends of the floor. It will not be a surprise to see his recruitment really take off over the coming months. Ty Nails (6’ 5, Wing, Stephens County) is a wiry and high rising athlete who was one of the top finishers in camp. He gets out in transition really well and looks to dunk everything he can. He has a smooth three point stroke to compliment his above the rim talents. A 1st Team All-Region performer as a Junior, Nails has the ability to be an All-State level player for Coach Chad Bridges this coming season. Arturo Varela (6’ 3, Wing, Lakeview Academy; 2019) is a solid and fundamentally sound prospect with good presence. He has the ability to post up opposing guards and exhibited nice footwork in morning drills. From the wing, he has a fluid three point stroke and does many of the little things that help win ball games. Brice Martin (6’6, Wing, Jonesboro; 2019) is a player with considerable upside for the next level. He can handle and shoot the ball well for his size and excels when attacking the rim. He is also a good rebounder and shot blocker. Named All-Region a Junior at Mt. Zion, he transferred cross town to Jonesboro High for his Senior season. Matthew Lane (6’ 3, Wing, Etowah) is a physically tough and strong prospect with good leaping ability. He crashes the boards hard, gets out on the break, and is an effective scorer inside 15 feet. With Etowah having graduated three frontcourt players to the College level, look for Lane to step up into a major role for the Eagles this coming season. Uba Ezigbo (6’ 3, Wing, Berkmar; 2019) is a wing player with excellent strength and athleticism. Very capable scorer in the paint and while slashing to the rim. Rebounds the ball really well for his size and plays with great energy. Uba is a standout in the classroom as well, carrying a 3.95 GPA and scoring a 1210 on the SAT. The camp roster had a plethora of players with good size, and many of these prospects will be high impact guys at the next level. In addition to the standouts already mentioned above, these players also impressed: Clovel D. Oliphant (6’ 7, Forward, Liberty County; 2019) is an intriguing prospect with considerable potential. He is very active in the paint and on the offensive boards. He plays above the rim and had several monster dunks in traffic. He was one of the camp’s top shot blockers and defended the lane well. While still raw, there is no doubt he has the talent to be a valuable player at the next level. In a camp full Rabun Gap Head Coach Roger Cox has had a long line of talented big men in his program over the past decade. This year is no different, as Tymon Szymanski (6’ 7, Rabun Gap; 2020) and Firat Ceylan (6’ 7, Forward, Rabun Gap; 2019) both impressed with their play. Szymanski is a talented young forward who is effective in the post and on the wing. He has a good feel for the game and is comfortable within a half-court offense set. He can stretch the defense with his shooting range. His length makes him an effective rim protector and he was one of the better rebounders in camp. With continued development, he has a chance to be a special player. Ceylan is a traditional back to the basket big man with good size and strength. He is comfortable staking out ground on the low block and posting up for scoring opportunities with both hands. He has a solid face up jumper which compliments his power game well. Tommy Kamarad (6’ 7, Forward, Buford; 2019) is a perimeter orientated forward with excellent length. He shoots the three ball really while spotting up. He also showed the ability to put the ball on the floor and knock down the pull-up. Although he suffered a minor injury and wasn’t able to finish camp, he showed enough in the time he was out there to warrant definite College attention. Trey Watson (6’ 6, Forward, The King’s Academy, 2019) is an under the radar prospect who had a good camp showing. 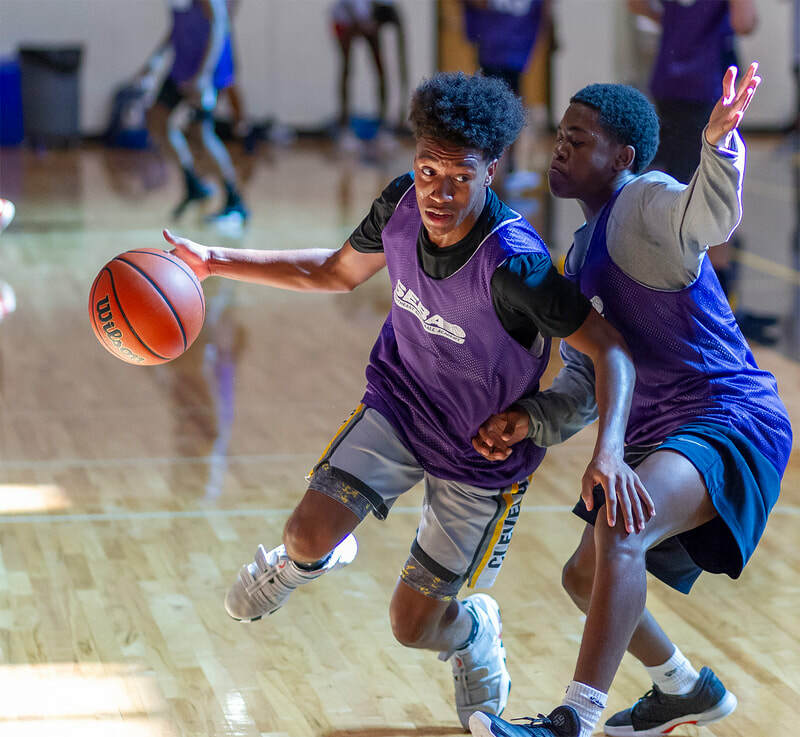 According to one of our camp evaluators (who is known for having a keen eye for identifying diamonds in the rough), Watson was one of the most complete forwards in attendance. He scored around the basket, knocked down mid-range jumpers, used a quick first step to blow past defender for layups, and passed the ball well. Defensively, he was very active and ripped down rebounds in the paint. His skills and a 3.5 GPA make him a very recruitable prospect. Niyon Ashley (6’ 5, Forward, New Manchester; 2019) was another player from New Manchester who impressed with his performance. The bouncy prospect had one of the camps best dunks in traffic where he posterized an unsuspecting defender. He rebounded the ball very well and scored consistently inside the paint. It is easy to see him averaging a double-double this coming year. Chandler Taylor (6’ 8, Forward, Arnold, FL, 2019) had a very good showing throughout the day. The Florida Panhandle prospect played great interior defense, recording 8 blocks in one camp game. He is hard-nosed and plays physical in the paint. Offensively, he showed an array of post moves and a solid mid-range shot. Burke Chebuhar (6’ 6, Forward, Walker School; 2020) is a nice young forward with good shooting range. He knocked down several long treys, has good footwork in the post, and also showed the ability to finish around the rim. As he continues to develop, he has a chance to be a really nice prospect. In camp settings, there is often a player who comes out of nowhere to jump start his recruitment. At this event, that player was Felix Uadiale (6’ 5, Wing, Eagles Landing Christian Academy). He ran the floor extremely well and had numerous high flying dunks that lit up the gym. He showed several good interior post moves and moved well without the ball. On the defensive end, he was very active and controlled the boards. Gary Jones III (6’ 10, Center, Sickles, FL; 2020) is an interesting player that made the most of his trip up from Tampa. At 6’10 and with a sturdy frame, he played the role of strong interior presence well. What is most intriguing about his game is that he has only been playing basketball for less than 2 years. There is huge room for growth and development, and he demonstrated the necessary work ethic which will propel him to new heights as a player. John Treanor (6’ 6, Forward, Marist; 2020) is a well built and physically strong prospect with inside-out skill set. He has good balance and absorbs contact well to score buckets inside. He also showed a good stroke from three point land and plays with good court awareness. Named 1st Team All-Region as a sophomore last year. Christopher Walden (6’6, Forward, Eastside) is a player who rose his stock, catching the eyes of several coaches and scouts. He has good length and moves well for his size. He was active on the boards, ran the floor hard, and knocked down several three point shots. Sola Adebisi (6’ 5, Forward, Cambridge; 2020) is a long and bouncy player with good potential. He plays with great effort and isn’t afraid to bang inside the paint. He showed the ability to put the ball on the floor and had several nice scoring drives from the wing. Should continue to develop well playing for a strong Cambridge program. In a camp full of talented bigs, Jager Dickson (6’ 8, Forward, Dalton) was one of the most versatile. We liked his ability to bang in the paint and score on the block, while also having the ability to step outside and knock down long jumpers. He plays with a good basketball IQ and works hard. We expect him to be one of the top players in North Georgia this coming season and is a player College Coaches will want to evaluate. Kendall Norrington (6’6, New Creation Christian Academy, 2019) is a physical forward with a very solid frame. He has the ability to dominate the boards and showed great hustle in taking multiple charges throughout the day. He often presents mismatch for opposing offense as he is able to power smaller wings around the rim, but beat bigger forwards off the dribble. An All-Region player last year at Mt. Zion, he has transferred for his Senior year to play at New Creation Christian Academy under Buck Hunter. Trent Gordon (6’ 6, Forward, Duluth; 2020) is a rapidly improving prospect with significant upside. He was one of the most athletic forwards in camp, and had several rim-shaking dunks that rocked the gym. He played with a great energy and was all over the court pulling rebounds, grabbing loose balls, blocking shots, and running the break. Look for him to really make his mark this coming season under Coach Huff at Duluth. Colin Kahl (6’ 6, Forward, Centennial; 2019) is a long forward who showed a versatile skill set. He was very active on the glass, converting several tips and put backs for scores. He has a solid three point stroke and plays with good understanding of the game. Look for him to be one of the top players in North Fulton this season. He is an excellent student with an “A” average and is starting to receive recruiting interest from several higher academic programs. ​Special Note: We want to extend sincere thanks to all of the High School and Travel Ball coaches throughout Georgia and the entire Southeast who supported this event. Additionally, we want to send a special thanks to Courtney Brooks (Whitefield Academy), Cabral Huff (Duluth), Virgil Amey (East Jackson), Antoine Stroud (Stone Mountain), Alan Taylor (Cumberland Christian), James Davis (Ball For Life Foundation), Brian Fisher (3Strong), Chuck Melito (Emory University); Dale Williams (Tampa Bay Bolts); Bradley Grayson (FCI Warriors), Darin Cooper, Travis Moore, Richard Kelly, and Shawn Courtney for their time and efforts in working with the players; Trent Markwith (Prep Hoops Georgia); Derick Pope (Hoop Network Grind); Jarrett Christian (Pro Movement); Kris Watkins (Southern Hoops Report); Georgia Hoop Circle (Barry Browner); Hoop Nation, the Georgia Basketball Coaches Association (GABCA), and last but not least Head Coach Phil Ponder, Assistant Coach Zach Altany, and the entire Oglethorpe University Basketball program for their ongoing support.